Austrian Dominions III: Croatia, Sclavonia and Dalmatia. This is a S.D.U.K. map of a rarely depicted portion of Europe including most of modern day Croatia. 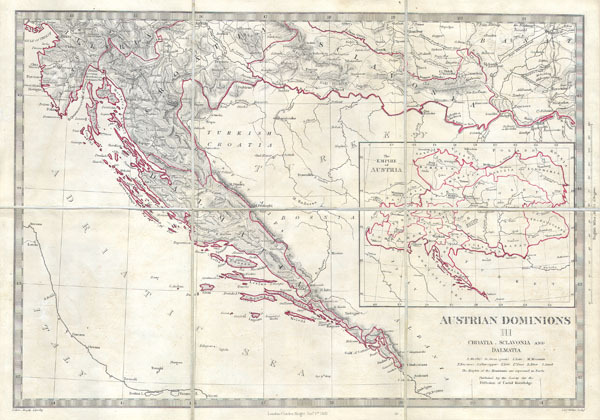 Depicts the south part of the Austrian Empire including Dalmatia, Croatia, and Sclavonia. A large inset shows the full extent of the Austrian empire. This is an unusual issue of an unusual map as it has been broken into pocket map format (six sheets) and backed with linen. This map was probably for inclusion in a library collection. Engraved by Weller for the Society for the Diffusion of Useful Knowledge under the Supervision of Charles Knight, dated Jan 1. 1852. Fine or perfect condition. Light age toning. Blank on verso.